With a setup blitz of media coverage from Fortune and Business Week in the business section to CBS on the political left and much of the green crowd in between, Bloom Energy and their “fuel cell” or very close approximation of one is having a media event Wednesday February 24th, 2010. That’s when some answers and a lot more questions will get opened up. A fuel cell is a device that takes molecules or atoms in on one side using a kind of ‘porous barrier’ to strip off electrons leaving the then disassociated atom or atoms on the other. That’s as simple traditional description as I have handy today. The issues have been the material(s) that make up the ‘barrier’ that so far have been discovered and are wildly expensive. Breakthroughs have been coming, we saw an ‘on the market’ methanol unit out of Japan a few weeks back. Progress is getting made. Reliability is up and costs down. The Bloom Energy unit, as far as the reports have it so far, is a fuel cell running a bit differently. In a high temperature containment vessel a hydrocarbon fuel such as ethanol, biodiesel, methane, or natural gas, is fed to one side of the cell. That is explained as attracting the oxygen’s ions fed from the other side. As the ions are pulled through the solid core, the resulting electrochemical reaction ‘creates’ electricity. One is to understand that the fuels of carbohydrates or hydrocarbons and the oxygen then combine and are emitted. The round about math from the reports have the results at half the emissions of combustion. Bloom Energy has persuaded 20 or so major companies to buy and install early models of the “Bloom Box” with admitted and PR hungry Google, Walmart, FedEx, and Staples pressing for the public information release. The quotes at the CBS 60 Minutes web page have John Donahoe, eBay’s CEO, saying its five boxes (about $3.75 million) were installed nine months ago and have already saved the company more than $100,000 ($133K annually) in electricity costs, “It’s been very successful thus far. They’ve done what they said they would do.” A bit further Donohue says, “When you average it over seven days a week, 24 hours a day, the Bloom box puts out five times as much power that we can actually use.” With the California and Federal incentives the capital cost is reported to be about half the price – thus less than a 15-year amortization. Fuel costs and which fuel aren’t mentioned. Bloom’s point might be to generate buzz for a public offering. The zing is the prediction that home units could be built for under $3,000 available in 5 to 10 years. The flip side is the venture capital is ready to get out; public offerings are how they make the money. This has meaning, what the meaning is will be the risk to the public offering share buyers. But Bloom has orders and sales revenue, and more production volume should reduce prices and speed the amortization making sales more attractive to buyers. Bloom CEO K.R. 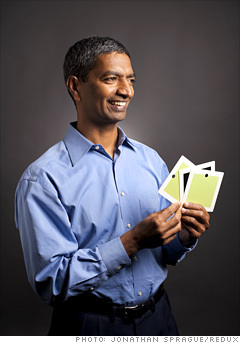 Sridhar is a 49-year-old scientist-turned entrepreneur who’s raised $400 million in venture capital for his Sunnyvale, California company. Sridhar originally developed the idea for the Bloom Box after developing a device while working at NASA that would be able to create oxygen on Mars. When NASA ditched the Mars mission, Sridhar thought to reverse the oxygen-creating Mars mission box and use oxygen as the input instead, a reverse of photovoltaic solar electricity in and oxygen out to oxygen in and electricity out. That’s being at the right place at the right time. Those credentials got the foothold with the venture capital people. With units built, sold, running and capital plus some cool names on the board like Colin Powell the incentive game could be quite useful for Bloom. Already at 20% in California and a 30% Federal subsidy support, a California pitch like that can’t be real hard to make. Can anyone contest or naysay on this? Sure . . . The technology is reported to be simple, thermally prepared ‘sand’ as in silicon, shaved to thin squares, (sound familiar?) coat them with special “inks” on opposing sides and stack ‘em up with a low cost alloy between them. The taller the stack the higher the output. Might beg a few questions for tomorrow. Add yours below. What’s the power ratio or energy efficiency? Using an internal combustion engine, then a turbine and now the Bloom Box, what are the ratios or percentages? Is there a specific build for each fuel type? Is there one build for methane, another for ethane, another for each alcohol? Is a switch of the silicon squares all that’s needed to switch fuels? If so, what part of a unit’s investment is standard and what part can be switched? Can fuels be mixed? Then there are the operating questions, like the uptime percent, the fuel purity and costs and consequences of fuel contamination. One wonders what, if any fuel conditioning might be required. I sure hope the Bloom Box has the attributes to go to scale from small vehicles in liquid fuels to home sized power and on to grid substation fueled by gases. One hope is Bloom Boxes make more economic sense than gas fired turbines, preferably by a wide margin. Parallel is the Randell Mill’s Blacklight project that also could make news soon – and it doesn’t need carbon-based fuels. News is moving fast, Brian Wang put up more background last night. It’s looking like a great year. Good Luck to everyone tomorrow, lets hope some smart people ask some good questions and they’re answered easily. it easy for save mony…. How soon can this be purchased for a home in Hawaii? This is really good. This is very good social work. I want to subscribe your group.